A volunteer sprinkles dirt on the casket of an unknown homeless man who died on the streets of Phoenix during an interment earlier this week in White Tanks Cemetery, Maricopa County’s “potter’s field” while a county detention officer stands guard. Indigent and homeless people who die in Maricopa County are buried in this expansive piece of desert west of Phoenix. More than 3,000 people in White Tanks, which opened in the mid 1994. The funerals are lonely affairs. 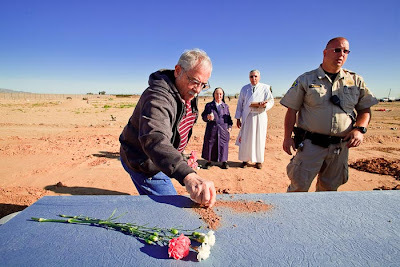 Usually the only people in attendance are the sheriff’s “chain gang,” clergy who volunteer to officiate and a Catholic nun, who sprinkles holy water on each casket. The funerals take place every Thursday. As minimal as these funerals are, they are still expensive. The county has spent millions of dollars burying the least fortunate in this lonely place. One of the options they’re considering is cremation. Several other counties in Arizona have already started cremating their indigent. I’ve been photographing the Sheriff’s chain gangs since 1999. I’ve been to White Tanks five or six times. There are more photos of the funerals and chain gangs in myPhotoShelter archive.